Living In The Power of The Holy Spirit. A Battle Royal: How to live a submitted life. “When you do what pleases you, does what you do please God? Good morning my friends, what a wonderful Alpha Experience evening we had last night. Our theme for the evening was all about The HOLY SPIRIT. We looked at the teaching, filling, empowering, seeking and yearning. We all admitted our NEED of God The Holy Spirit. However, one of the main points of our discussion was what we’d talked about the previous week: How does God guide us? How does the Holy Spirit let us know His will? How can I live in such a way that I know I’m going to be victorious as a Christian? We will understand and know His guidance the more we SUBMIT ourselves completely to Christ, but what we discovered afresh last night was, the more you submit yourself to God, the more you begin to realise how just un-submitted we really are. And therefore, how much we need God’s grace, mercy, forgiveness, cleansing, power and presence every single day. The Walk of genuine faith in Jesus really is a battle of WILLS: God’s Will and Our Will. The Walk of genuine faith in Jesus really is a battle of DESIRES: God’s desires and our own sinful desires. The Walk of genuine faith in Jesus really is a battle of WANTS: What God wants and what we want. The Walk of genuine faith in Jesus really is a battle of PLEASURES: What pleases God and what pleases us. Thankfully our wills, desires, wants and pleasures change as we submit ourselves to Jesus and seek the fullness of Holy Spirit, but then as we go on in the walk of faith, they sneak back into our souls, sometimes, undetected. Thankfully Holy Spirit reveals our condition: He’s a gentle Saviour the Lord Jesus Christ, but he’ll not leave you, those who’ve received Him as Lord, in a condition of sin for very long. His heart’s desire is that you become more and more like Him: Holy, righteous, good and faithful. When we follow our heart’s desires, wills, wants and pleasures instead of or in-spite of God’s revealed will, we become like an Adulterer: Unfaithful to the one who’s loved us. 4 You adulterous people, don’t you know that friendship with the world is hatred towards God? Anyone who chooses to be a friend of the world becomes an enemy of God. (We become friends of the world when we do worldly things that God hates). 5 Or do you think Scripture says without reason that the spirit he caused to live in us envies intensely? 9 Grieve, mourn and wail. Change your laughter to mourning and your joy to gloom. 10 Humble yourselves before the Lord, and he will lift you up. When Holy Spirit shows you your condition, He does not do it to make you feel guilty, but to bring you back, to stop you falling, to keep you on track with God’s good plan for your life. However, just like Adam and Eve hid in the garden when they sinned against God, our NATURAL tendency is to hide too, we want to cover it up, pretend it never happened, keep it in the darkness. As God looked for and called for Adam and Eve, he’ll be doing the same with you and me by His Spirit. “Adam, where are you?” … “Eve, come out of hiding”…. Notice what happens when we respond to the pull of the Spirit, when we draw near to God, “He draws near to us”. What grace, what love, what amazing mercy. Wash, Purify, Grieve, Mourn, Cry: i.e. feel what God feels because of your sinful wills, desires, wants and pleasures and mourn about it. Decide in your hearts that you want to be cleansed and set-free again. WHEN: When you submit, resist, draw near, wash, grieve and mourn and cry: i.e. HUMBLE yourself towards God: He WILL LIFT YOU UP. WHAT IF? : What if I’ve failed again? What if I keep falling? My friends, if you feel guilty then you are in a good place, because God’s not giving up on you. It’s when you stop feeling guilty and keep sinning you should really start to worry, because “God resists the proud”. However, if you feel the sorrow of a sinner’s heart, then you will receive from the Lord “MORE GRACE” James 4:6. Remember Psalm 103:12. When you come in true confession and contrition (sorrow for sin), then God takes your sins away from you and FORGETS all about them, as if they never happened. The Holy Spirit, that God caused to LIVE IN US, “Envies Intensely”: i.e. He’s jealous for God’s Glory and your own goodness in the Christian life. There’s an intense feeling of JOY when we walk in step with the Spirit. 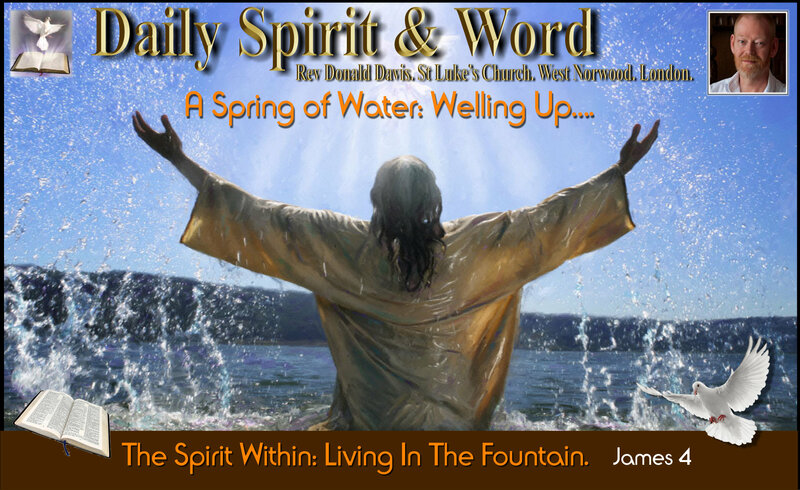 The Holy Spirit: Becomes in us (Inside Us) a SPRING or FOUNTAIN… i.e. we get filled up with the Holy Spirit from within… It’s not external, but internal filling we need. Some people erroneously, mistakenly, foolishly “Call Down” the Holy Spirit, but how can you call down someone who’s already there? He is in you if you are saved by Jesus. You are full of Holy Spirit, but we leak… All we need is a greater filling, more of His fullness, more LORD!…. “Go on being filled with the Spirit” Ephesians 5:8-18. Awesome! Because when God lifts you up, you’re going to have one of those MOUNTAIN-TOP EXPERIENCES. Focus on God’s desires, focus on Jesus, focus on His awesome tender compassion, kindness and love. He give GRACE to the Humble. The Spirit’s Presence is like a FOUNTAIN. Go on being filled… i.e. every day.